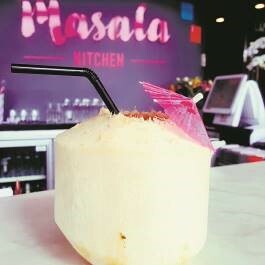 When Masala Kitchen promises to “bring you a truly unique sensory experience” they mean that in every way possible. The first thing you’ll encounter when you walk through the door is the tantalising aroma of spices and rich sauces emanating from the kitchen and the bold, lollyshop colour scheme and patterns in the decor. To limber up your taste buds you must order a signature cocktail because you’ve probably never had a cocktail that includes any of the following: tamarind sauce, cumin, star aniseed, cinnamon, rose petals, green chilli. They’re extraordinary! Go with a group of friends so you can choose a large selection of dishes and try a bit of everything. The Lamb Minced Stuffed Mushrooms, Bhel Puri or Tandoori Fish Tikka are good openers. Abide by their suggestion and have the “must try” main, Oh My Goat! It is delectable. There are plenty of vegetarian, vegan and gluten free choices on the menu and this along with the uplifting ambience makes it a great option for a group night out.